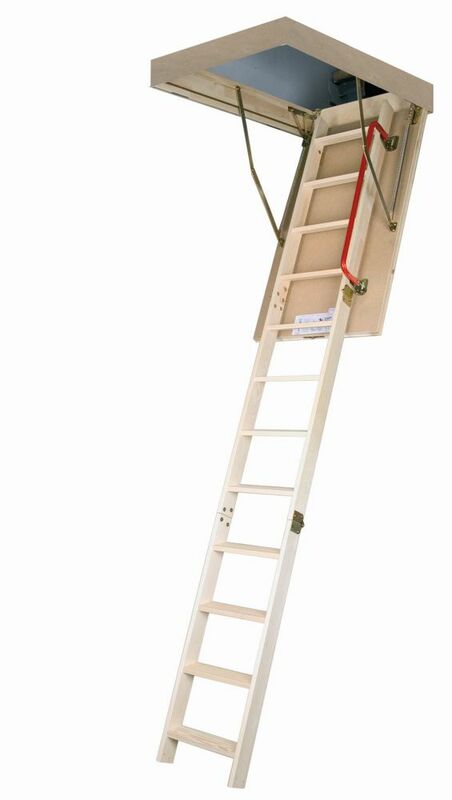 This Featherlite aluminum attic ladder has a working load capability of 375-lbs. This aluminum attic ladder fits ceiling heights of 7.67-ft to 10.25-ft and has a rough opening of 22.5-in X 54-in. The AA2210R5FL attic ladder features an R5 insulated door that helps conserve energy, weather stripping to reduce drafts and air leakage, slip resistant cross-tread steps, adjustable shoes, an advanced cylinder design for smooth and easy operation, and an ergonomic pull down T-handle. This Featherlite 6 foot heavy duty non-conductive fibreglass step ladder has a load capacity of 375lbs, rated Grade IAA. This ladder is equipped with a Professional Top with multiple tool slots, heavy-duty gusset bracing, slip-resistant boot, heavy duty wrap-around spreader arms, wide back braces, and double-rivet step construction. The Featherlite FL-3410-06 stepladder meets or exceeds the safety standards set by ANSI, CSA, and OSHA. This Featherlite 4 foot non-conductive fibreglass step ladder has a load capacity of 250lbs, rated Grade I. This ladder is equipped with a top with tool slots, heavy-duty gusset bracing, slip-resistant rubber shoes, pinch-proof spreader arms, wide back braces, and double-rivet step construction. The Featherlite FL-3110-04 stepladder meets or exceeds the safety standards set by ANSI, CSA, and OSHA. 8 ft. 11-inch, 25-inch x 47-inch Insulated Wood Attic Ladder with 300 lb. Capacity Type IA Rating This elegant, superior quality Fakro LWP Insulated Wood Attic Ladder fits in R.O. 25-inch x 47-inch and ceiling heights from 7 ft. 5-inch to 8 ft. 11-inch It is built from quality pine and fully assembled. Locking mechanism installed inside an insulated and sealed door panel ensures the attic entry is airtight while closed to avoid energy loss. The ladder length can be adjusted within 1.3-inch even after cutting the side rails, this allows for perfect fit to ceiling height and additional adjustment after floor renovation. Eleven steps feature a tread rise of about 10-inch to ensure safety and comfort. Included red metal handrail provides additional security and can be installed on either side of the ladder. Specially designed door attaching brackets provide additional space for a foot and unique springs design moves the springs down with the ladder's door to make attic entry wide and comfortable. 8 ft. 11-inch, 25-inch x 47-inch Insulated Wood Attic Ladder with 300 lb. Capacity Type IA Rating is rated 4.5 out of 5 by 62. Rated 4 out of 5 by Alphaintervention from Love it... clean lines and I don't have a cord... Love it... clean lines and I don't have a cord hanging down from the ceiling. Overall quality is good and sturdy and installing was easy. Rated 5 out of 5 by Les from Installation instructions were helpful. I cut the legs as instructed... Installation instructions were helpful. I cut the legs as instructed and decided to purchase the slip-on ladder feet.They wouldn't work on the angle cut bottoms. The slip on feet are meant for square cut legs and add about 1" to the length. This is not the impression you get from their animated instruction video. Rated 4 out of 5 by Al from Fairly easy to install. Ladder is stable.... Fairly easy to install. Ladder is stable. Rated 5 out of 5 by Thebuilder from Excellent ladder This is an excellent attic ladder. I can’t speak for other brands since this is the first attic ladder I have ever owned and installed. One bad thing about this ladder is the directions are horrible but if you have any kind of skills you really don’t need directions. I am really impressed with how strong this ladder is. I am also impressed with how smooth it opens and closes. I like the latch rather than the cord that you see on other models. The latch gives you confirmation that it is closed and the rubber seal around the door gives you a seal every time. Some people complained about the long rod used to open the door, it’s not difficult to use. One thing I noticed in all the reviews I have read on several different models is they are damaged in shipping. I had this ladder shipped to Home Depot and I inspected it before I took it home. The ladder had no damage whatsoever. Excellent ladder and I do recommend buying it if your in the market. Rated 5 out of 5 by Slugrat from Excellent craftsmanship and easy to use. Very happy with it.... Excellent craftsmanship and easy to use. Very happy with it. Install went well too. Great quality.